Tom joined The Young Theatre on 14th January 2007 - a date which will remain seared into his brain for all time. During his time with the group his roles have ranged from John Proctor in The Crucible to Old-Green-Grasshopper in James and the Giant Peach as well as seven years (at time of writing!) as pantomime silly boy. Tom has also directed for the group (2011 award winning production of Oubliette and 2014's summer show Winnie-the-Pooh) and has on numerous occasions been pulled to the 'dark side' of backstage roles - he stage managed both 2014's and 2016's entries to NT Connections. He was one third of the cast of Noel Coward's The Better Half which, on the way to the AETF Semi-Final and NDFA All British Winners Final, won numerous awards in 2012. In addition to YT, Tom has also worked extensively with The Chiltern Shakespeare Company and Shared Intent Theatre, as well as appearing in Beaconsfield Theatre Group's production of The Ladykillers. 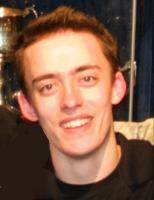 Tom first served on the committee in the 2009 / 2010 season as a Member's Representative. It was for his work this season that he was awarded The Southgate Cup. This was followed by a stint as Membership Secretary before he served as Group Director from 2011 - 2014, since when he has been General Manager. Tom was made an Honorary Life Member of the group in September 2015.